I also wasn’t very artful with the cilantro garnish, but don’t let the craptastic photo deter you. (Check out the recipe source below so you can see how this is really supposed to look!) The recipe has a few different moving parts, so it is a little time-consuming, but not bad. And totally worth it. I can’t wait to make this again. 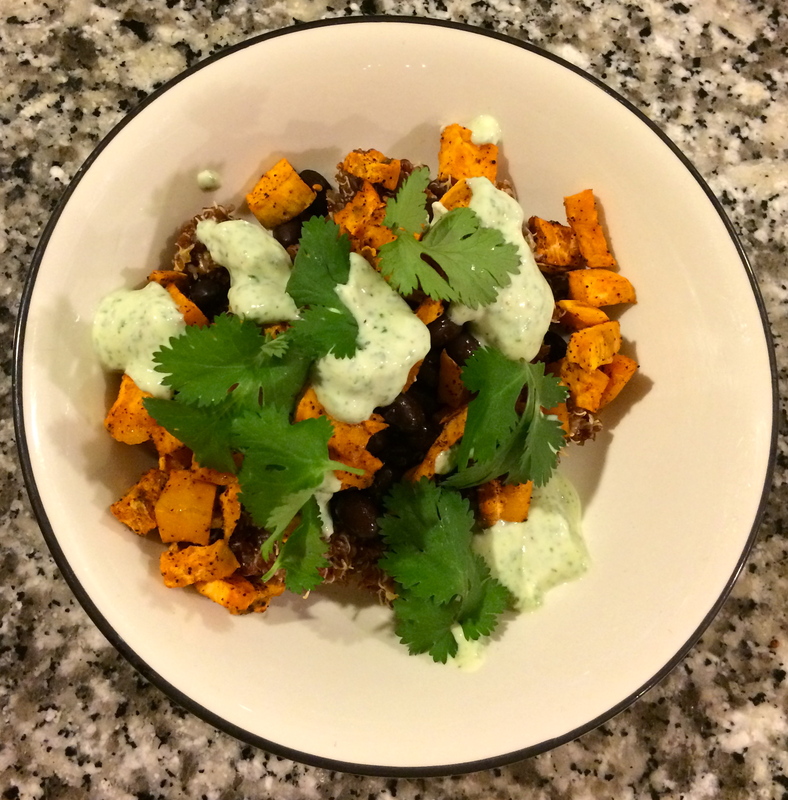 If you don’t like cilantro, you could top with some plain Greek Yogurt and lime juice. I also used canned, rinsed black beans. 2. Line a rimmed baking sheet with foil and spray it with non-stick cooking spray. 3. In a small bowl, combine the diced sweet potato with the olive oil and spices; spread sweet potatoes on the prepared baking sheet in a single layer. 4. Roast for 10 – 13 minutes, or until the potato is fork tender. 1. In a colander set over the sink, rinse and drain the red quinoa. 2. Place the drained quinoa in a medium-sized saucepan with the water and 1/4 teaspoon of kosher salt set over medium-high heat. 3. Bring to a boil, then cover with a lid; lower the heat to medium-low. 4. Cook the quinoa for about 15 minutes, until all of the liquid is absorbed. 5. Remove the saucepan from the heat and season the quinoa with the remaining 1/4 teaspoon of kosher salt, chili powder, cumin, garlic powder, lime juice, and cilantro. 1. Place all of the Cilantro Cream ingredients in a blender and blend until smooth. 1. Divide the prepared quinoa between 2 or 3 serving bowls (depending who hungry you are!). 2. Top the quinoa with the black beans and roasted sweet potato. 3. Drizzle the cilantro cream on top with a spoon. 4. Garnish with more cilantro, if desired.